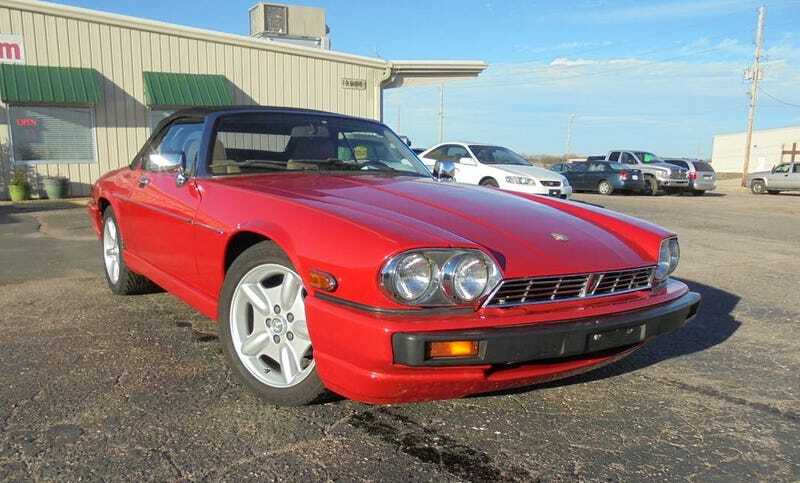 For $5,999, Could This 1990 Jaguar XJ-S V12 Have You Waving The Union Jack? It goes without saying, in light of the recent terrorist attacks there, that we stand with Great Britain. Similarly, today’s Nice Price or Crack Pipe Jag XJS stands as one of that nation’s most laudable automotive achievements. But will its price stand up to scrutiny? Poor-shaw/Poorshh. You know, we’re so freaking lazy that we can’t even give the founder of Germany’s preeminent sports car maker the two syllables his name deserves. That’s okay though, as it’s developed into a bit of a endearment, much in the same way as has Chevy for Chevrolet or Foster Child for Lotus. Last Friday’s Subaru-powered 1972 Porsche 914 suffered yet another ignominy by drawing a 77-percent Crack Pipe vote for its Boxster-level price tag. Oh well, if the Kardashians can find an audience, so too will that 914. Let’s do some channel hopping for today’s candidate, which is one of the last cars built in England with a V12 engine. The V12 is of course, a bit of a mythical beast. Only a handful of manufacturers have ever even offered the configuration, and those that have placed them at or near the top of their model range. Time wounds all heels and today you can buy cars like this 1990 Jaguar XJ-S convertible with its V12 engine for what you might expect to pay for a decade old Mustang V6 with a questionable provenance and a few miles under its belt. The V12 here is a derivative of the one that debuted in the XKE in 1971, and has a familial relationship to the DOHC edition that powered the legendary Jaguar XK13 racer. Here it’s 5.3-litres and produces 263-bhp due to its Michael May-design HE heads. These engines pull like a locomotive and give the XJ-S a driving experience unlike any other. This car happens to look unique as well. It comes with body-colored bumper snoods on both ends and 17-inch wheels from its later inheritor, the XK8. I’m not sure either addition is a successful tarting, but at least you’d know which one is yours at a Jag meet. The Damson Red paint looks to be okay in the photos, although the ad admits to a little fade here and there… mostly there. The interior too seems tidy but with some wear showing on the driver’s seat, and some high school parking lot level speakers in the doors. One thing to mention about these interiors, they are tighter than pregnant Rhianna’s G-string. The dash is right up against the windscreen base, but even so there’s really little room in here. Switchgear is placed where it could fit forcing much of it to be hidden behind the steering wheel and control levers. Likewise, the doors are right on top of the seats making the funky chicken nigh-on impossible. It’s all very old school and quaint, but if you suffer from claustrophobia you might want to put the top down when driving. On the flip side, should you suffer from coulrophobia—and why would you not?—then you’ll want to drive with the top up and the doors locked. There’s 112,000 miles on the clock here, and the car comes with a clean title and a Hartz cloth top. There’s also apparently a new radiator, new shocks (four in back!) springs, brakes, suspension bushings, and a battery. What’s left to go wrong, am I right? Well, plenty to be sure, but at $5,999 this Jag won’t break the bank leaving reserves for any future maladies. What you need to decide is whether or not that price eats too deeply into those reserves. What do you think, could this dealer-offered XJ-S command $5,999? Or, is that price just another indication of the sun setting on the British empire? Wichita, KS Craigslist, or go here if the ad disappears. H/T to hairylarry for the hookup! At $23,500, Is The Seller Of This Subaru-Powered 1972 Porsche 914 All Wet?